Have I finally lost the plot? In what way could headphones possibly be like camera tripods? Buying a really cheap tripod because they don’t yet know how much they’ll use a tripod and don’t want to commit to the expense until they’re sure they’ll use it. Realising that their cheap tripod is so flimsy it’s worse than useless and upgrading to a midrange tripod. Getting frustrated with their midrange tripod – maybe it’s too heavy, lacks a quick release plate, or the head adjustments aren’t as smooth as they’d like. Finally they buy a decent tripod. They could’ve saved money by skipping the cheap and intermediate tripods and going straight to the third one, but it seems to be a rite of passage for photographers to go through the each stage. Having recently made the move to Bluetooth earphones, I think much the same applies to them. It was my brief ownership of the Pixel 2 that prompted me to try Bluetooth earphones. Although it does come with a USB-C to 3.5mm adapter, I thought I’d get into the spirit of the thing and try going wireless. I was quickly sold on it and wish I’d made the change years ago – I love the freedom of being able to put my phone in any pocket without worrying about whether the earphone cable will reach. The problem was finding the right earphones. I’m no audiophile, and always got by with the cheap earphones included with my phones. I figured a cheap pair of Bluetooth earphones would do. I didn’t want heavy over-ear headphones, as I find them uncomfortably warm, especially when I’m out walking. I’m also not a huge fan of in-ear earphones designed to go right into the ear canal, as I find them uncomfortable. Ideally I wanted lightweight on-ear earphones that clipped over the ear. I tried a pair, and to be fair they weren’t terrible, especially considering that they were only around £20. The biggest problem was a constant hiss, noticeable at low volumes and between tracks. I presume it was electrical interference from the proximity of the radio components to the speakers, possibly combined with inadequate shielding. I moved up, compromising on the ear canal format in the hopes of getting better quality. 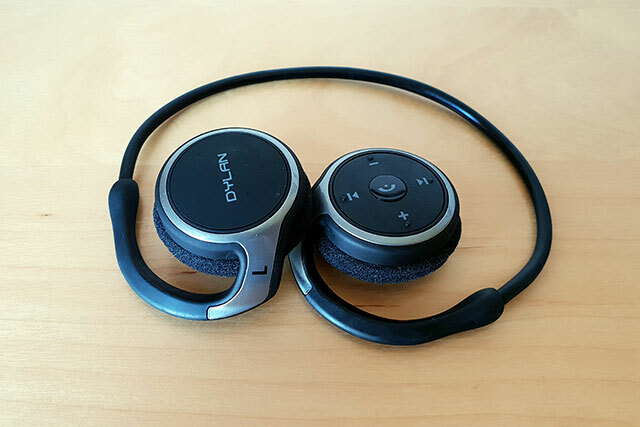 I actually tried a couple of different pairs in the £50 – £80 range, including one pair that had a neckband design. None were ideal. Most suffered from the same kind of interference as the cheaper pair. Firstly, they’re an earbud design, sitting in the outer ear rather than the ear canal. Although that means they let in more ambient sound, I find them much more comfortable than ones that go into the ear canal. Secondly, I was interested in the close integration with Google Assistant and wanted to see how it worked. They have, admittedly, had some very mixed reviews. Most reviews critcise the fiddly case design, and they have a point. 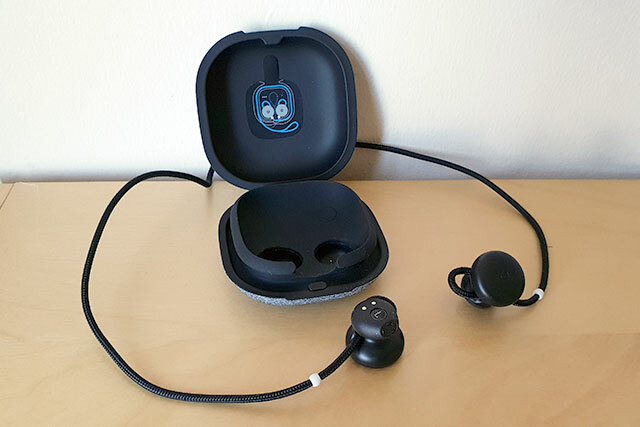 Originally, the only way to turn them off was to put them in the case, and it takes a bit of practice to do that without touching the touch sensitive right earbud. If you don’t turn them off, there’s a risk you’ll accidentally tap them and they’ll be merrily playing music in your pocket when you’re not wearing them. Obviously Google intend you to put them in the case when you’re not using them, but that shouldn’t be necessary when you only want to take them off for a short period of time. It would even help if the cord was a bit longer, so that they could hang around your neck when not in use without it feeling like they might slip off. Google are now rolling out a function to switch them off with a triple tap, which will be a big help. Aside from that, though, they’re a world away from the cheaper ones I tried. Despite not sitting in the ear canal, and therefore not blocking as much ambient sound, I find I don’t need to turn the volume up as much as I did with the cheaper options. They also have a surprising amount of bass and a much richer sound than any earphones I’d used before. Now, as I say, I’d only previously used cheap earphones, and the Pixel Buds are probably no match for true audiophile earphones. For me, though, they were a revelation – I didn’t realise earbuds could sound like that. I ended up following exactly the same path with earphones as I, and many photographers, followed with tripods. I could’ve saved some money by spending more upfront. So, odd as it may sound, earphones really are like tripods.